Dramatic details have emerged of how a suspected would-be assassin — a tallish and dark young man wearing a yellow T-shirt — daringly stood in the middle of a crowd at a Zanu PF rally at White City Stadium in Bulawayo, about 30 metres away from the VIP stage where President Emmerson Mnangagwa and other senior party officials were seated, before viciously launching a grenade that fortuitously missed his apparent target — “the crocodile”. The attack, perpetrated by a suspect police detectives described as “a young male, between the ages of 23 and 25 years, about 1,7 metres tall, and dark”, appears like a scene from the James Bond spy film series. This comes as 35 security personnel held a meeting at Munhumutapa government building on Wednesday to rethink the security system and conduct a post-mortem of the horrific explosion which claimed the lives of two security aides, Colour Sergeant Stanley Mugunzva of the Presidential Guard unit in Dzivaresekwa in Harare who was assigned to Vice-President retired General Constantino Chiwenga and his co-deputy Kembo Mohadi’s aide Nelson Dube. Inside security sources and government officials told the Zimbabwe Independent this week that if the grenade had not hit a VIP tent rope, caught a deflection to the right and shaved off the cheek of a presidential security aide, it was likely to have landed and exploded within a fatal radius around Mnangagwa. Whether he was the main target or not is still under probe. “Investigations are continuing; we have come across some good leads yet there are also complications,” a senior police detective said. “We have discovered the suspect we are looking for was seized by the army soon after the grenade attack incident. Witnesses told us this. We have interviewed many witnesses and they have given us useful information. The attack came amid infighting within security agencies and escalating political brinkmanship between Mnangagwa and Chiwenga due to unresolved leadership issues within Zanu PF and over the control of levers of state power. Mnangagwa’s spokesman George Charamba suggested this when he located the attack in the context of “unresolved leadership issues”. Rivalry and hostilities between security services also manifested themselves during the Wednesday meeting and continue to do so in the midst of the investigations. The Independent has previously reported on the tensions between Mnangagwa and Chiwenga, and also among security forces. Purges after the coup that brought in the new administration within the police and Central Intelligence Organisation (CIO) ranks were fuelled by the conflicts and distrust at the height of former president Robert Mugabe’s succession battle. Sources said police, the intelligence services and the military are sweating to find a breakthrough to the shock attack unprecedented in Zimbabwe political and electoral processes. A senior police source said although a suspect was seized by the army, this has not helped but complicated the investigation. It has reignited the rivalry and infighting among security agencies, apart from posing questions about the weapon itself, its origins and motive behind the attack. While police think they are close to the truth if they interview the alleged hired gun, the military stands between them and the suspect. “After the grenade attack, police interviewed people who told them that they saw some guy who launched an object that was directed towards the VIP stage. The witnesses said the man lobbed the item from about 30 metres to 35 metres from the podium, but it was diverted by a rope before shaving off a security aide’s cheek prior to landing and detonating,” a security source said. Soon after the interviews at the crime scene, sources said, police followed the leads of witnesses who described the suspect and what he was wearing in the direction to which he fled. Sources added that when the suspect got to some point in the surrounding townships around White City Stadium the military grabbed him and he has not been seen ever since. “The police have been trying to establish and confirm with the military whether they have the suspect or not in their custody, but to no avail. This has frustrated the investigations which police say now entirely depend on their access and interrogation of the suspect,” another security source said. “Specialized investigation units from the Criminal Investigation Department, military and CIO are currently camped in Bulawayo trying to get to the bottom of the issue. There is no proper coordination. There was even chaos over hotel accommodation for investigation teams. Sources added that the investigation team is also probing the source of the explosive device, with indications showing that it could not have come from the police because they no longer keep grenades following last year’s coup. “For now police are trying to understand whether or not the suspect was acting as a lone wolf — alone — or with others. Weapons experts are analysing the debris from the explosion to determine what type of grenade it was and where it came from,” a source said. Although no information has been obtained yet about the source of the grenade, the motive and exact target, investigations so far show Mnangagwa was the likely target. The footage and pictures show Chiwenga was following Mnangagwa and Mohadi before briefly stopping to engage his wife Mary, seconds before the explosion. If he had moved forward seconds before that, he could have been hit by the grenade. 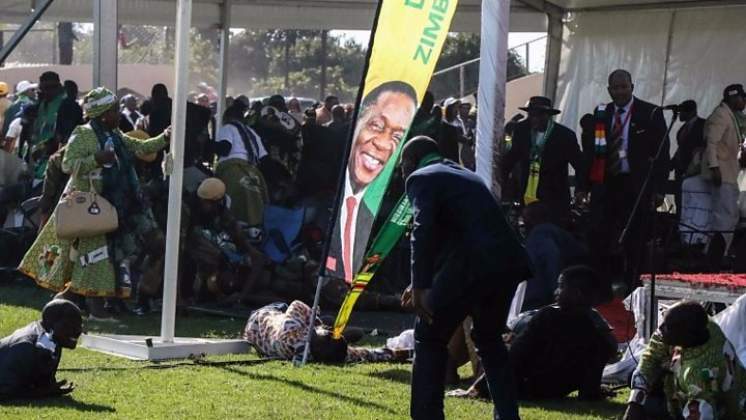 In the aftermath of the explosion, Mnangagwa this week told the BBC that indications are that the suspect was linked to G40, a former Zanu PF faction which had coalesced around ex-first lady Grace Mugabe. “My hunch, without evidence, is that people who are aggrieved by the new dispensation are the G40 cabal. That is the logical and reasonable conclusion one may take until evidence is brought forward and until you pin down as to why this happened, when you get the person and he tells us his history and the purpose of what happened and why he did what he did,” Mnangagwa said. However, Mugabe’s nephew Patrick Zhuwao, who was a key member of the G40 faction dismantled by the coup, said Britain’s New Scotland Yard should take a leading role in carrying out a probe into the Bulawayo explosion. “It’s the wish of the majority of Zimbabweans that your government should take a leaf from the American government which has availed the FBI to assist with the investigation of the grenade attack that killed two people and injured over a hundred others at a political rally addressed by Ethiopian Prime Minister Abiy Ahmed Ali in Addis Ababa on the same day of the Zanu PF bombing,” Zhuwao said in an open letter to British Prime Minister Theresa May. Police say they are still investigating. Efforts to get comment from the army were unsuccessful.